The labor movement in the United States is under full-scale attack, and its leaders are laying down and playing dead. They have no plans to fight the rightist capitalist onslaught spearheaded by Donald Trump. Worse yet, having been burned by their support for Democrat Hillary Clinton, top labor leaders are doing everything they can to play ball with labor-hater Trump. Laborers’ International Union president Terry O’Sullivan issued a press release saying “LIUNA is ready to work with the new Administration in the coming years to strengthen our country.” Doug McCarron, president of the United Brotherhood of Carpenters, was downright fawning. After Trump declared “I love Doug,” McCarron gushed to the media the president’s inaugural speech was “a great moment for working men and women in the United States.” But behind the love fest, working people will get screwed by a president who has declared that wages in the U.S. are too high, has fought unions at his Las Vegas hotel and elsewhere and supports union-busting “right to work” laws. Various commentators have argued that the construction union leaders are being played. For sure. But then they are also getting played when they regularly back the Democrats. Labor will always get screwed so long as it is chained to the parties of capital. But forging those chains is how the sellout labor bureaucrats got in office, and how they got where they are today: facing the abyss. The paralysis of union tops in the face of threatened “right-to-work” legislation or a potential Supreme Court decision that would do the same to public sector workers, is a declaration of bankruptcy. It demonstrates again that their fundamental loyalty is to the capitalist system, not the working people they claim to represent. What’s needed is to build a fighting opposition inside the labor movement based on a program of sharp class struggle, against the suicidal class collaboration of the present pro-capitalist labor bureaucracy. There’s got to be a clean sweep, or the unions are going down. A year ago, labor unionists breathed a sigh of relief as the U.S. Supreme Court, by a 4-4 tie vote, killed Friedrichs v. California Teachers Association by letting stand the ruling of the appeals court. Funded by deep-pocketed anti-union “think tanks,” the lawsuit sought to cripple the unions financially by outlawing the “agency shop,” the requirement that employees at an organized workplace pay union dues or an equivalent. The target was public sector unions (representing 35% of the workforce) which because of their political connections have been able to withstand the union-busting onslaught that has decimated labor in the private sector, where union membership is down to 6%. Now anti-union forces are gearing up for another attempt with a new Supreme Court. Meanwhile, in January Kentucky enacted a double-whammy “right-to-work” law coupled with a “no-right-to-strike” provision for public employees. Missouri passed its “RTW” law in February (it already had a public sector strike ban). And on February 1, a bill for a National Right to Work Act was introduced in the U.S. House of Representatives by two of the most reactionary Congressmen in the country, Steve King of Iowa and Joe Wilson of South Carolina. If neither of them is formally part of the right-wing Republican Freedom Caucus it is because this pair stands even further to the right. It’s no wonder that spewing out such garbage, King is a hero of fascist and fascistic “white nationalists.” He is not only opposed to gay marriage, but even to civil marriage. And it’s entirely predictable that such a race-hater would also be a labor-hater. The fact is that the campaign for open-shop “right to work” laws, now threatening a nationwide offensive, was championed from its beginning by racist ideologues who oppose unions because in order to be effective, the unions must organize black and white workers together. “Right to work” as a deceptively-named political movement was launched in the 1940s in Texas by a prolific right-wing political organizer named Vance Muse. Muse’s modus operandi was to rake in funds from some of America’s most powerful capitalist families – the Sloans (General Motors), Pews (Sun Oil), and Duponts, along with leading southern grandees – while hobnobbing with fascist groups like the Klan and “silver shirt” leader Gerald L. K. Smith. Muse organized a Georgia convention of a “Southern Committee to Uphold the Constitution” in 1934 chaired by former National Association of Manufacturers president John H. Kirby and featuring Smith and other fascists. Muse and the fascist forces he mobilized with industry backing opposed unions because, in Muse’s words, the agency shop meant that “from now on, white women and white men will be forced into organizations with black African apes whom they will have to call ‘brother’ or lose their jobs.” (Gerard Colby, Du Pont Dynasty: Behind the Nylon Curtain ) Muse was joined in his efforts by his older sister Ida Darden, who was notable as the publicity director of the Texas Association Opposed to Woman Suffrage in 1916, and the editor of the Southern Conservative newspaper from 1950 to 1961, which campaigned against unions, civil rights, modern art and Hollywood movies. Christian American lobbying led to laws in Texas limiting picketing and other union activities. But while far-right and fascist organizations such as Muse’s groups were early and strident advocates of open-shop laws, they were not alone. Dixon writes that by 1947, when “right to work” was made law in Texas, its major backer was the Texas Manufacturers Association, headed by Herman Brown of the Brown & Root construction firm. By this time, the TMA kept its distance from Vance Muse and allied far-right groups. And the anti-labor forces were not the only ones to make racist appeals. In opposing “open shop” laws, Harry Acreman of the Texas AFL “invoked race as an issue, arguing that Right-to Work would end segregation in southern workplaces,” as Dixon noted. Ever since Franklin D. Roosevelt’s 1930s New Deal, labor officialdom has been in the Democrats’ pocket. While the Republicans opposed unions outright, FDR sought to hogtie them with government control, from the 1934 Wagner Act to the WWII War Labor Board. The kept labor bureaucracy went along with its wartime no-strike pledge, while the government jailed the Minneapolis Teamster leaders and Trotskyists for opposing the imperialist slaughter. Since a mainstay of FDR’s “New Deal coalition” were the Southern Dixiecrats, in opposing anti-labor legislation the craven union misleaders appealed to these racists for support. That doomed the postwar attempt to organize the South (Operation Dixie), which could have succeeded had the CIO fought Jim Crow segregation. That was when employers’ “right-to-work” drive could have been stopped cold. Instead, you got the “open shop” South, a bastion of anti-unionism. And under the Democratic administration of Harry Truman, the 1948 Taft-Hartley Act was passed outlawing the closed shop and banning communists from union leadership positions. Although the AFL and CIO tops claimed to oppose that “slave labor” law, they refused to strike against it, meekly submitting to the dictates of capital. Meanwhile, as part of the anti-Soviet Cold War, liberal Democrats purged the unions of the “reds” who had built them, laying the basis for the subsequent witch-hunting associated with Republican senator Joseph McCarthy. And McCarthy’s chief witch-hunter, Roy Cohn, was the mentor of Donald Trump. Today, the drive to roll back the remaining gains of the industrial unions that were born in the class struggles of the 1930s is intensifying in the context of a political crisis of U.S. imperialism. A bogus “democracy” elevates a fake-populist billionaire and woman-hating media personality into the Oval Office. Once ensconced, Donald Trump promises a skeptical Wall Street (which considers him unreliable and favored Democrat Hillary Clinton) mountains of golden loot from the federal treasury, while throwing a few crumbs to some gullible labor fakers. His arch-racist attorney general Jeff Sessions vows to ratchet up police repression. And whipping up anti-immigrant hysteria, he reinforces the key structural element of American capitalism since it was founded on chattel slavery: the division of American workers along race-color lines and the brutal racial oppression of black people. So how do the AFL-CIO leaders plan to fight the threat of national “right-to-work” legislation or court-ordered “open shop” rules that would cripple unions? Answer: they don’t. There are no plans for mass mobilization, besieging Congress and the Supreme Court or jamming Wall Street to shut down the center of world financial capital. At most they talk of stepping up “education” campaigns to convince workers to join the union. Even at that level union leaders remain beholden to the bosses, relying on dues check-offs which give management the power to turn off the financial spigot whenever it wants. In New York City, the United Federation of Teachers won’t get union dues subtracted from salaries in January until March. A class-struggle leadership would collect the dues itself. The only way to defeat this anti-labor onslaught is not to seek a new “New Deal Coalition” that would continue to subordinate the working class to one party of racist U.S. imperialism, but to drive out the pro-capitalist bureaucracy that chains the unions to the Democrats and forge a class-struggle leadership of labor that defends all those oppressed by capitalism. 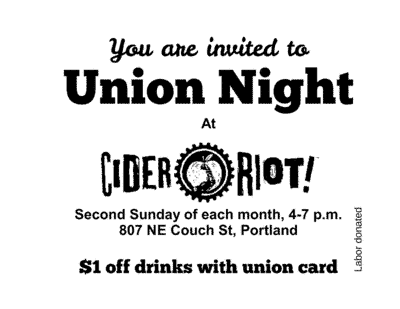 In the Pacific Northwest, CSWP has played a leading role fighting the threat of “right-to-work” union-busting. In September 2013, Wyatt McMinn, vice president of Local 10 of the International Union of Printers and Allied Trades (IUPAT) and a CSWP spokesman was arrested and threatened with a year in jail for protesting a meeting of the union-hating Freedom Foundation. The class-struggle unionist, a founder of CSWP, was eventually found not-guilty, a victory for labor solidarity and the more than a dozen union and labor councils that endorsed his defense. Two years later, in the fall of 2015, as Friedrichs loomed at the Supreme Court, members of CSWP, elected from their unions as delegates to the Oregon state AFL-CIO convention, brought a motion that “area unions should prepare a major region-wide stop-work action against this effort to impoverish workers.” The resolution won significant support but was shot down by the state AFL leadership, which has repeatedly refused to fight union-busting with industrial action, instead devoting itself to lobbying Democrats. One of their main arguments is that opinion polls show “the public” as being hostile to unions. But as the experience of the 2011 labor uprising in Wisconsin against an anti-labor governor showed, once unions began acting like defenders of workers, public support soared … and then plummeted when protests were called off in favor of voting for Democrats. For Worker/Immigrant Mobilization to Stop Deportations! These are dark days for immigrants, Muslims and their families, while the working class as a whole is under attack. Immigrants fear the unexpected knock on the door; children worry if their parents will be home when they return from school. Rumors of raids fly, sowing panic and confusion. Muslims and other religious minorities fear attack in their homes, at their mosques and workplaces or in public by fascistic terrorists incited by Trump’s deranged rants. And while significant numbers of workers voted for Trump because of the anti-worker policies of the Democrats, the Republicans (with the support of the White House) are pushing hard for a national “right-to-work” law aimed at destroying unions. It is urgently necessary for the power of the working class to be mobilized to stop the raids and deportations, to defend immigrants, black people and all those threatened by racist persecution, and to bust the would-be union-busters! Since Trump inherited the formidable machinery of anti-immigrant repression constructed under the Obama administration, Immigrations and Customs Enforcement has increased the number of arrests by about one third. Actual deportations have not yet reached the Democrat Obama’s record. First there was the “Muslim ban,” presently held up in the courts. Now the immigration police are ordered to go after anyone who “in the judgment of an immigration officer … pose[s] a risk to public safety or national security.” In other words, anyone who “looks” like they don’t belong in a racist’s fantasy-America. In his speech to the Congress, Trump promoted the “VOICE” initiative, a federal program designed to stir up xenophobic hatred by publishing a police blotter of crimes allegedly committed by immigrants. Then the government floated its sadistic intention to separate the children of refugees seeking asylum from their parents. The government says that 680 immigrants were arrested in one week. One woman in El Paso, Texas was arrested by ICE at the local court house during a hearing in which she had sought protection against an abusive boyfriend. In Phoenix, Arizona, Guadalupe García de Rayos had lived and worked without papers in the U.S. for over 20 years, since she was 14 years old. She had agreed to voluntarily report to the immigration authorities twice a year in exchange for staying her deportation. But when she reported on 8 February, she was arrested. Hundreds of people, including her children, gathered at the ICE office and bravely sought to block the van that was taking her away. In Montrose, Colorado, Bernardo Medina was kidnapped by ICE agents and imprisoned in a “detention facility.” Medina is a natural-born U.S. citizen, but ICE police told him “You don’t look like you were born in Montrose.” In Woodburn, Oregon, eleven agricultural workers on their way to the fields were taken by the ICE police on Feb. 24, with seven held in the Tacoma immigration jail and all scheduled for deportation. Muhammad Ali Jr., son of the legendary boxer, was detained and questioned for two hours about his religious beliefs at a Florida airport. Each day brings news of a new atrocity. Locally, another case that has gained notoriety is that of Daniel Ramirez Medina, a 23 year old Mexican immigrant living in Seattle who was brought to this country as a child and has no criminal record. ICE took him and his father on 10 February. He was held in the Tacoma jail until March 29 on $15,000 bail. Ramirez Medina is a “Dreamer,” whose deportation was “deferred” under Obama’s Deferred Action for Childhood Arrivals (DACA) program – until now. Near-daily protests have demanded his release, along with freedom for the thou- sands of other immigrants held there. Recently, hundreds of prisoners at the ICE jail in Tacoma are taking part in a rolling hunger strike, with daily vigils and rallies by their supporters outside. Break ICE Terror With Workers Action! What is happening here? The government – supported by Democrats and Republicans alike – whips up racist prejudice with its obsessing over crimes by those it declares “illegal.” Of course, one could just as logically publish a blotter of violent crimes allegedly committed by white men, or left-handed Lutherans aged 30-49, or any arbitrary category: what is at work here is the logic of racism and nationalist prejudice. In fact, undocumented immigrants are significantly less likely than U.S. citizens to commit crimes, particularly violent crimes. The sadistic, cynical “VOICE” initiative is copied directly from the Nazis, whose propaganda obsessed over “criminal Jews” in order to dehumanize an entire people. Every American is under the eye of a secretive state police (Geheime Staatspolizei in German), which can kidnap those it declares “illegal” and drag them before deportation tribunals: what we call “ICE” the Nazis called the Gestapo. And why not call the network of secretive “detention centers” by their right name: concentration camps where tens of thousands languish for months with no rights to speak of. Dedication of “The Dockworker” statue in Amsterdam, commemorating the February 1941 general strike against Nazi deportations of Jews. Trump is not a fascist. Neither was “deporter-in-chief” Obama, whose immigration policies are the basis and model for Trump’s. The reason for the similarities between the ugly official racism in fascist Germany and “democratic” America is the need of the ruling capitalist class to regiment the population for war abroad and police state at home by demonizing and attacking an “enemy within.” CSWP says to our fellow workers: we must not be neutral in this war of terror being waged against our neighbors and fellow workers. This assault on the rights of all of us must be defeated, and the working class – immigrant and native-born together – has the power to defeat it. By all indications this May 1 (International Workers Day) will be a big “Day Without an Immigrant” protest/strike, possibly similar to the historic protests in 2006 that revived May Day in this country. In March SEIU-United Service Workers West, the California mega-local, declared that it would strike on May Day, calling for a “general strike.” But when progressive union leaders and their leftist publicists speak of a “strike” or even a “general strike,” their aim is not to shut down production but to jazz-up a class-collaborationist protest/festival, and mobilize the “base” for the Democratic Party of racism and imperialist war. A strike is not an individual choice to take an afternoon off for a protest march, but an organized deployment of specifically working-class power that strikes at the heart of the capitalist system, its profit-making machine. Workers seeking to organize such actions will often find that the first line of opposition facing them is not a line of riot police but the leading bureaucracy of their own organizations, committed to labor “peace” and class collaboration. The Trump regime is as fragile as it is fearsome. But the Democratic Party’s “resistance” won’t bring it down. Democrats are partner parties with the Republicans in union-busting and immigrant-bashing. They just want union and Latino votes, and a war with Russia. The key is for the workers to unite and fight for our own class interests. Protests against deportation should be backed up by solid strike action. Already immigrant workers around the country risked their jobs to boldly take part in the 16 February “Day Without Immigrants.” They must not stand alone! Workers defense guards based on the unions must be prepared to defend mosques and immigrant communities. The anti-fascist mobilization resolutions adopted by a number of local unions are a step in this direction.